FR-33.2 has in-built recording functions. Two-way recording: When you are having a conversation on Skype, you can use the recording function in FR-33.2 to record the entire conversation, capturing voice from both sides. The recording function works not only in Skype-to-Skype calls, but also for Skype calls to mobiles, landlines and international calls. One-way recording: Use FR-33.2 as a high-quality microphone to record and produce sound files, for use in podcasts or voice notes and other applications. Yes you can. The recording application, FreeREC, can be activated independent of IPEVO Control Center. Windows: Activate FreeREC.exe in the directory where ICC is installed. Mac: Activate FreeREC listed in the Applications. In the IPEVO Control Center, click the "Open Windows audio control panel" link at the bottom. The Audio Control panel for Windows OS appears. 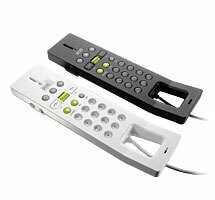 Select your choice of audio output/input device in the Audio Control panel and close it. Back in IPEVO Control Center, select FR-33.2 as the audio input/output/ringer device in the "Skype Audio Device" corner. From now on, only Skype calls will be handled by your FR-33.2. Back in IPEVO Control Center, select FR-33.1 as the audio input/output/ringer device in the "Skype Audio Device" corner. From now on, only Skype calls will be handled by your FR-33.1. Long-press the 0 key until a + sign appears. Enter the country code (in the case of the U.S., press 1). Enter the area code and local number. For example, if the area code is 408 and the local number is 555-5555, you would need to enter the following number in total. Which functions are not supported in FR-33.1? The following functions are not supported in FR-33.1. Which functions are not supported in FR-33.2? The following functions are not supported in FR-33.2. The keys on the phone do not work anymore although dialing through the software works. Make sure the IPEVO Control Center (ICC) is activated. If the ICC icon does not appear in the bottom task bar, select Start button > Programs > IPEVO > IPEVO Control Center. If the screen says Skype is not activated, go to Skype and select Tools > Options > Advanced Settings and make sure ICC is allowed to access Skype API. Increase the FR-33.2 speaker volume using the volume keys on the left side of the body. Increase the volume settings on Skype. Increase the volume settings on the computer. The screen turns on but nothing appears inside. Make sure ICC is activated. If the ICC icon does not appear in the bottom task bar, select Start button > Programs > IPEVO > IPEVO Control Center. Which operating systems are compatible with FR-33.2/FR-33.1? * We do not officially support 64-bit Windows versions. However, you should be able to use most of the FR-33.2/FR-33.1's functions in a 64-bit Windows environment, except for two-way sound recording. FR-33.2/FR-33.1 does not support Linux. The speaker and microphone might work, but the keypads will not. After entering a phone number or selecting a contact, FR-33.2 automatically makes a call before pressing the Call button. This might be caused by a network connection problem. To check your network connection, ping your Internet Service Provider (ISP) or a generic web address to see the amount of delay in the network. Type in "ping <ISP address or website> -t" and you'll see the response time streamed in real time. For example, to ping www.yahoo.com, type in "ping yahoo.com -t". The amount of delay should not go beyond 100~200 ms in order to have a smooth conversation over the web. If it does, we recommend that you work with your Internet Service Provider to resolve the situation. I hear an echo on FR-33.2. Disconnect your FR-33.2 and make calls from your computer and see if you still hear the echo. If so, you may wish to contact your Internet Service Provider regarding the quality of your connection. 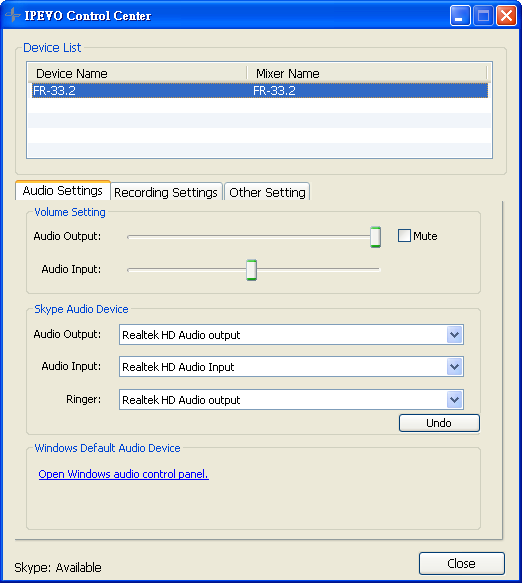 Additionally, in a Windows environment, you can try turning on the Mute Microphone Volume setting. Open the Volume Control panel from Program Files > Accessories > Entertainment > Volume Control. Go to Options > Content menu and select FR-33.2 as the mixer device. Turn on the Mute option in the Microphone volume setting. I hear statics on FR-33.2. Please make sure your FR-33.2 is connected directly to your computer's USB port, without a USB hub in between. The person on the other end of the call cannot hear me. Activate IPEVO Control Center and select the “Sound Settings” tab. 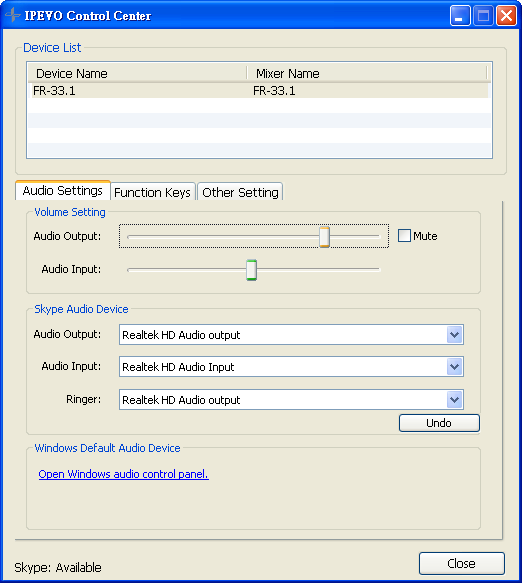 In the "Skype Audio Devices” corner, change the “Audio Input”, “Audio Output” and “Ring tone” setting to FR-33.2. Cannot dial phone numbers using the keypad, but dialing in Skype software works. Make sure the IPEVO Control Center is activated. Cannot make calls from Skype Call History screen. When you are looking at the Call History window, any input will be recognized as search keywords. You can resume the normal operation once you exit the Call History window. (Windows) I cannot install the driver. The Setup program crashes after language selection. The Temp folder, in which the OS stores temporary files, will open. Make sure you can see all hidden files by enabling the “Display all hidden files and folders” option in My Computer > Tools > File Folder Options > View. Delete all files from the Temp folder. During the driver installation, a warning message says that the software had failed the Windows logo test and would severely damage the system if I continue. The logo test warning message appears when you are trying to install a driver not fully updated for the OS. Please download the latest version of the FR-33.2 driver and install it instead. IPEVO Control Center (ICC) is using too much CPU power. ICC consumes approximately 30% of CPU power. If you are also using a webcam, that number increases as high as 70%. If you feel the computer is responding much slower than usual, disable ICC when not in use. (Windows Vista) Screensaver becomes disabled when the IPEVO Control Center is running. This is a known issue. Please update the IPEVO Control Center to the latest version. I hear constant noise on FR-33.2 when I use it with a ThinkPad laptop. Download the “Windows XP Installation supplement files” from the Lenovo website. Restart the computer and launch the IPEVO Control Center.